An investment deal for China's initial Public-Private Partnership (PPP) project in the railway sector was signed on Monday, signaling the first ever railway sector investment and financing deal in which private capital holds a controlling stake. 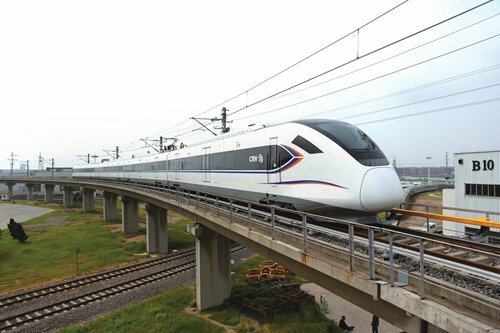 Experts said that after solving issues concerning the operation and profitability of this high-speed rail line in East China's Zhejiang Province, the project could be a true PPP and be copied, accelerating railway expansion in China as the country becomes a rail power. Chinese conglomerate Fosun Group said in a statement e-mailed to the Global Times on Monday that the railway is a "State-level pilot PPP project in the railway sector" and "No.1 PPP project" in Zhejiang. The 269-kilometer rail will connect the provincial capital Hangzhou with Shaoxing to the south, ending at Taizhou further south in the province. A section 224 kilometers long will be new tracks, with a target travel speed of 350 kilometers per hour. The project is set to involve investment of 40.9 billion yuan ($6.27 billion). A consortium led by Fosun will hold a 51 percent stake, and China Railway Corp (CRC), the State-run railway operator, will hold a 15 percent stake. The Zhejiang provincial government will have a 13.6 percent stake and the city governments of Shaoxing and Taizhou will hold a combined 20.4 percent stake. A platform company will execute the investment, construction, operation, maintenance and transfer during a franchise period of 30 years, excluding four years for construction, according to the Fosun statement. The project will be run under a build-own-operate-transfer mode and the railway will be handed over to the government after the 30-year period. "Private investment, via the conduit of PPPs, will further diversify the organizational structure and development model of railways in China. It is also a way to explore the tapping of commercial resources to develop public utilities. Using private companies' integration capacity will make resource allocation in the market more scientific and efficient," Fosun Group Chairman Guo Guangchang was cited in the statement as saying. "Fosun will strive to make sure that the first railway with a private majority stakeholder can stand the test of time," Guo said. Tian Yun, head of the Information Department at the China Society of Macroeconomics Research Center, told the Global Times on Monday that the project could be a PPP project in true sense of the word and be "cloned" nationwide if it can be smoothly operated and profitable. "Bringing in social capital as a new source of funding and cutting costs or improving efficiency in areas such as procurement - this is what a true PPP is all about," Tian said. "The issues are simple: How the railway will be operated, how to work with CRC with undisturbed connectivity and yet ensure its independence, and how private investors will make money from this railway line," Tian said. According to Fosun, the incentives from this railway include subsidies in addition to operating income to reflect the "uncertainty" of operating a railway. In the near term, CRC will operate the railway on behalf of the platform company until the latter is able to operate the railway by itself. Tian said that if Fosun and its partners figure out how to make things work, there is a long list of projects that can be financed using this model, as private-sector capital is abundant and sorely needs plausible investment targets. Sun Zhang, a rail expert and professor at Shanghai Tongji University, told the Global Times that the participation of private capital in China's railway construction and operation is of historic significance. "Meticulous and flexible, the private companies will be able to cut costs in the railway sector," Sun said. "More importantly, as China desperately needs more railways while State capital is stretched thin and burdened with debt, the introduction of private capital will accelerate railway network expansion in China and allow the country to reap railway successes such as those enjoyed by Japan and the US, pushing the nation greatly forward," noted Sun. By 2020, the country plans to extend its railway mileage to 150,000 kilometers, according to media reports. The US still leads the world with 228,000 kilometers of railway.